We were waiting in anticipation for over a year to capture Anthea and Jacque’s destination wedding photography! The bride chose the family estate on De Vaal River for the wedding ceremony and reception. This special place combines the epic views and serenity of the river with spacious luxury. Friends and family travelled form near and far to witness this day. Our team traveled from Cape Town to capture Anthea’s destination wedding photography. 14th of October turned out to be the perfect day for this very special wedding! Warm and pleasant, with a gentle breeze, just enough to lift the evils the Bride was walking down the aisle. The bridesmaids and the bridesman (love it!) came first, followed by Anthea on the arm of her father. What a beautiful Bride! We all loved the ceremony, conducted under the floral arch on the rolling lawns. The couple exchanged vows and rings and soon the guests got to shower them in confetti, as they exited the aisle. There was laughs and hugs and all those real emotional moments, so precious for destination wedding photography! We love the Booker family estate, with green lawns, ponds and old willows. Picture perfect! But the best was the speedboat. The boys got the classic luxury boat ready and soon we head into the sunset. What a dream for destination wedding photography! 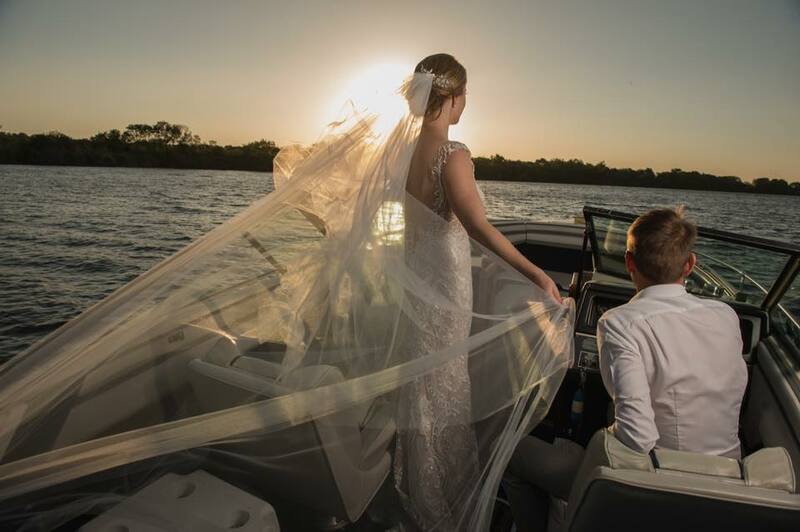 Anthea in her designer gown, with long veil, gracefully sailing towards the sunset with Jacques. We captured some epic images while sailing on the river and the couple enjoyed a glass of bubbles and a moment to themselves before returning to the venue. The reception hall was a clear tent raised on the lawn. We could watch the sunset coming over the river, while the couple swirled in the first dance. The decor consisted of raw tables, naked bulbs and cascades of flowers, so elegant and suited for this outdoor location! The guests danced the night away and celebrated this union of two friends and soulmates.